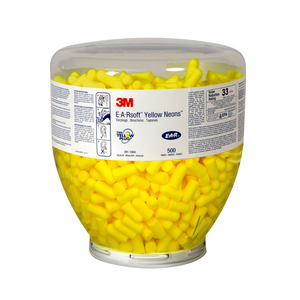 3M™ E-A-Rsoft™ Yellow Neons™ earplugs in a refill container for One Touch™ dispenser 391-1000. Yellow Neons™ earplugs seal the earcanal with soft, slow-recovery foam for excellent noise reduction and comfort. 3Mâ„¢ E-A-Rsoftâ„¢ Yellow Neonsâ„¢ earplugs in a refill container for One Touchâ„¢ dispenser 391-1000. Yellow Neonsâ„¢ earplugs seal the earcanal with soft, slow-recovery foam for excellent noise reduction and comfort.